On the left are the 3 lipsticks followed by the 2 lipglosses to the right. 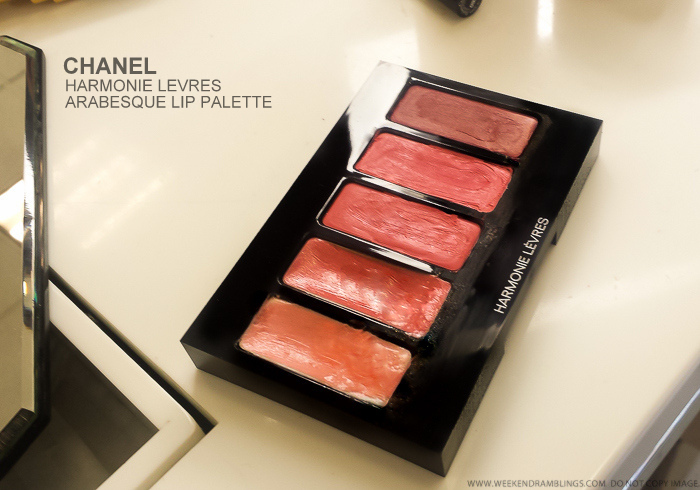 Chanel Harmonie Arabesque lip palette seems like a good buy, especially if you are a fan of the Chanel lip products and of course the luxe packaging. I liked all the colors included in the palette. The lightest lipgloss does seem a little too pale and sheer for my darker lips, but it can be layered over the other lipsticks in the palette for a softer/glossy lip color. I found this Youtube video reviewing the Chanel Harmonie Levres Arabesque Lip Palette , and as mentioned in the review (main review starts around 4.21), the lipsticks in the palette do seem a little hard, and it is a little difficult to pick up the color to apply. I used a disposable gloss wand to apply the lip color, and it picks up color easily enough, but I am not sure how these would perform with a softer lip brush. Generally, though, I find lip brushes give a sheerer, more controlled application, and while this might not seem too much of a bother if you have lighter/evenly pigmented lips, on darker lips like mine, the lack of opaque coverage might be an issue for some. 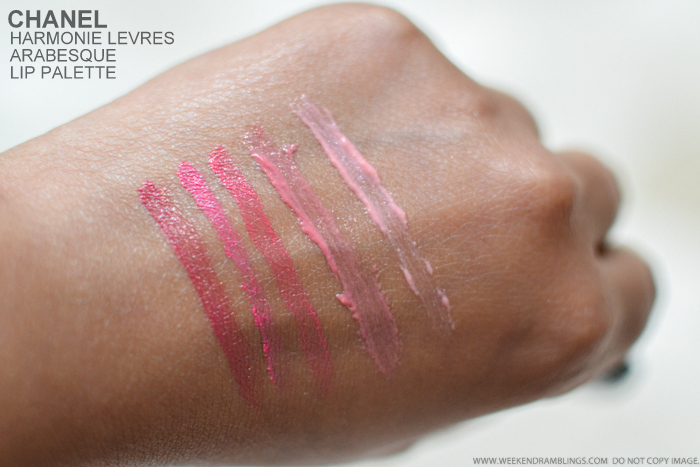 Overall though, to me, the Chanel Harmonie Arabesque lip palette seems like a good buy. Do give this a try at the counter if the colors appeal to you.